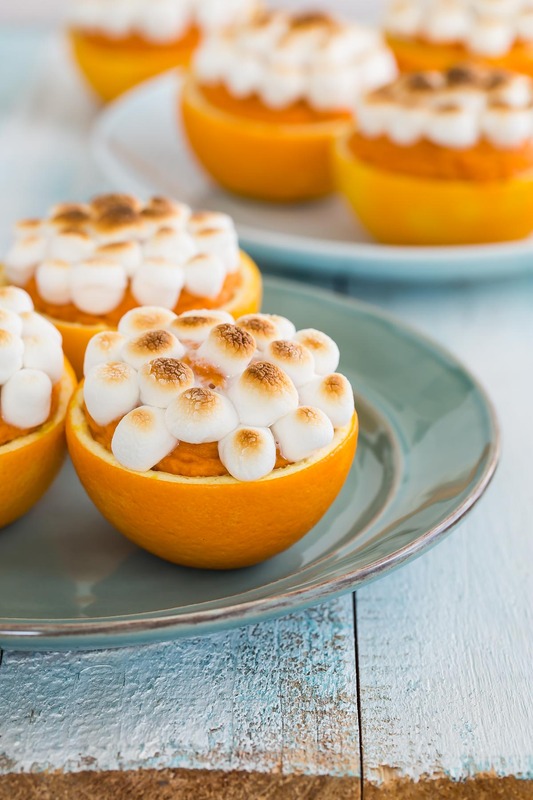 These Sweet Potatoes in Orange Cups are one of the most kid and adult friendly holiday sides you can make! If you've never made this Weelicious classic recipe the time is now! You can watch the how-to video here or the Facebook Live I cooked up last week to see a few tips for making them days ahead of time so you can chill on the holidays and spend more time with your family! With Thanksgiving right around the corner, I tested this recipe out on several little guinea pigs. I made these for a recent "kid's dinner party" that my friends and I do every week and I can't even tell you how hard I laughed when I pulled these sweet potatoes out of the oven and three of the kids simultaneously yelled "cupcakes"! No matter what we said they decided the orange and white "cupcakes" were a holiday treat and scarfed them down. The only “oops” moment came when one the little girl looked at me with a huge hunk of orange peel in her mouth and said, “I don't like the wrapper”. Whoops! 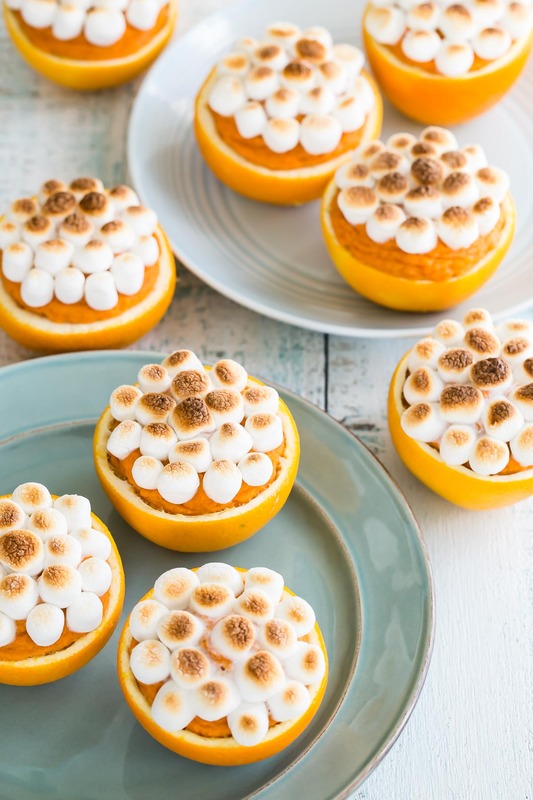 These heavenly treats only take minutes to prepare, and they made quite a visual and edible impact on the kids and adults alike. I'm a big fan of cooking this dish with evaporated skim milk because it makes the potatoes really fluffy without the added fat of heavy cream. 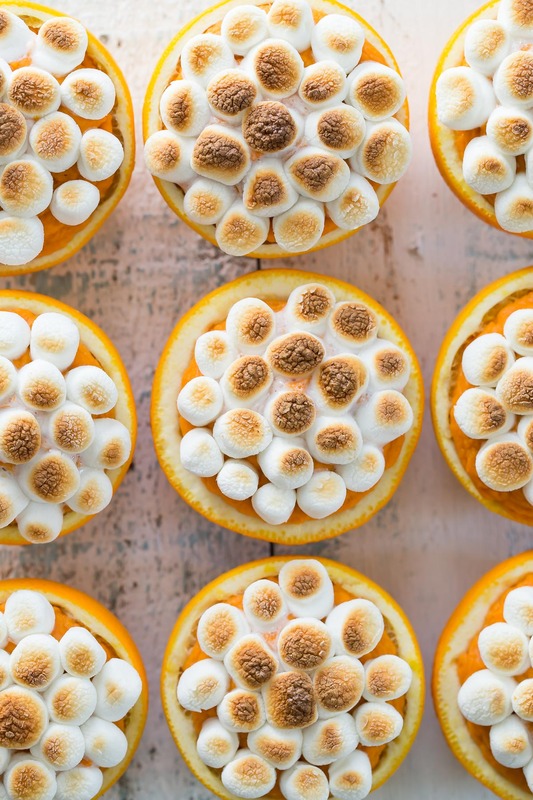 I usually don't like to use foods that have a ton of sugar, but just a few mini marshmallows really take this recipe to the next level for kids and makes it fun for them. After all, it's the “icing”! They’re not essential to the recipe, so you can easily leave them out. This recipe is also a time saver when you're cooking Thanksgiving dinner, because the orange pulp that you scoop out goes right into the Weelicious Orange Cranberry Sauce! A green vegetable, some succulent brined turkey and you have a perfect meal for the entire family with a few leftovers for the next day. 1. Preheat oven to 400 degrees. Poke the yams several times with a fork or knife to pierce the skin. 2. Place on foil or a sheet tray in the oven and bake for 1 hour. 3. Let yams cool for several minutes, cut in half and scoop out the fluffy insides (I love eating the high fiber skin as a snack). 4. Mash the yams with butter, maple syrup, evaporated milk and salt until creamy and fluffy. 5. Cut the oranges in half and slice a very thin disk from the bottom so they rest flat. The skins are actually going to be the “bowls”. 6. With a pairing knife cut around the inside rim of the orange removing the orange sections and pulp. Place any of the orange juice and pulp in a bowl and discard the white membranes and seeds. Save the juice and pulp for cranberry sauce recipe or just enjoy as a snack. 7. 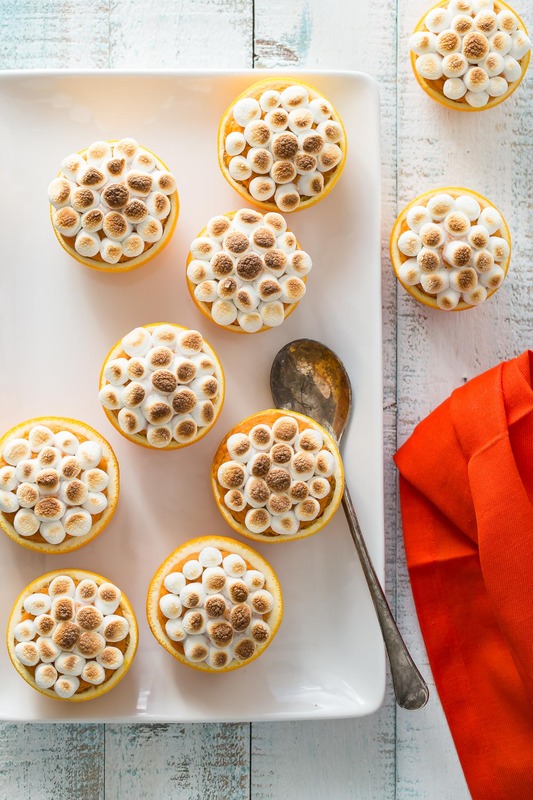 Fill each orange cup with 1/4 cup of puree and top with several mini marshmallows (you can cover and refrigerate these overnight). 9. Place on a sheet tray and bake for 20-25 minutes. Kat, I used coconut oil to replace the butter and unsweetened vanilla almond milk to replace the milk. We've yet to assemble them with the orange cups and marshmallows, but the puree is absolutely delicious! Thanks Amy! Will try that today! Delicious!! I mean Weelicious! My 2 years old daughter couldn't stop eating them in Thanksgiving and my parets in law love them. The presentation is amazing but better is when you taste them..
Can this be made as a non dairy treat? My nephews would LOVE this, but they are allergic to dairy. Do you have any suggestions for transporting these to a Friendsgiving potluck I will be attending? I would place them in a baking dish covered with foil or plastic wrap! You could wait until you get there to brown the marshmallows on top if there will be oven space available, too!